One of the lessons in my free eCourse, How To Plan Your Own Homeschool Preschool Curriculum, is all about choosing monthly themes. I prefer to choose monthly themes to simplify the planning process. 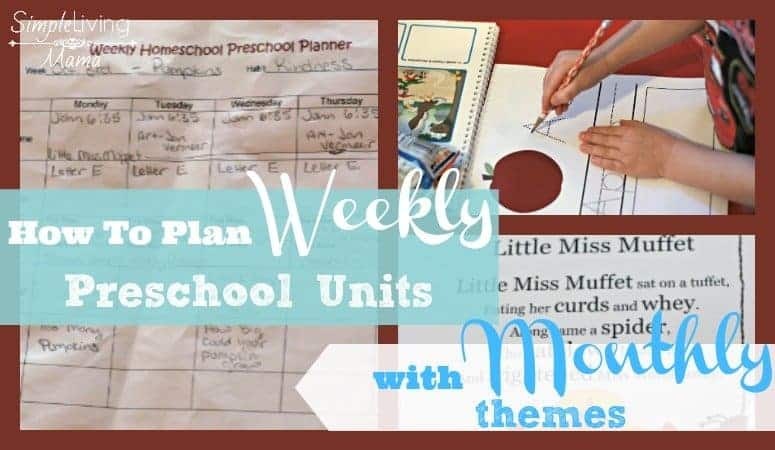 Those monthly themes are then broken down into weekly lessons using my weekly homeschool preschool planner. I thought it would be good to show you just how I break down my monthly themes into weekly preschool units. The first thing I work on is choosing our memory work for the week. I am using My Father’s World Adventures for my older children, so our Bible verse comes from that curriculum. I also like to have my preschoolers memorize a nursery rhyme, so I will choose one from one of my nursery rhyme books. 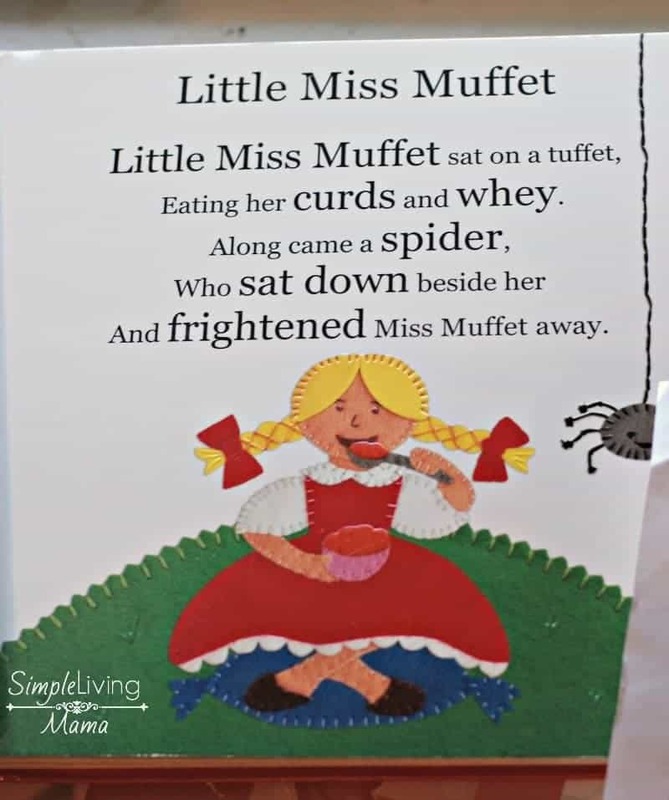 I occasionally add the nursery rhyme to our morning board, or I may just read straight from the book during our morning time. The next thing I do is plan our activities. I have started creating preschool literature activity guides to help me have a quick resource for pulling those activities. My goal is to have at least one craft per week. Sometimes we will do two crafts. 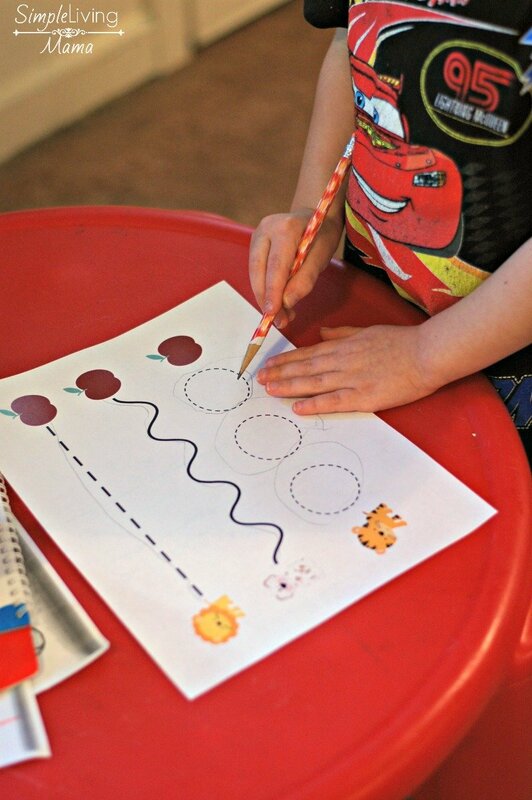 Next, I choose fine motor activities. I keep a stash of busy bags in my preschool bin in our homeschool room. 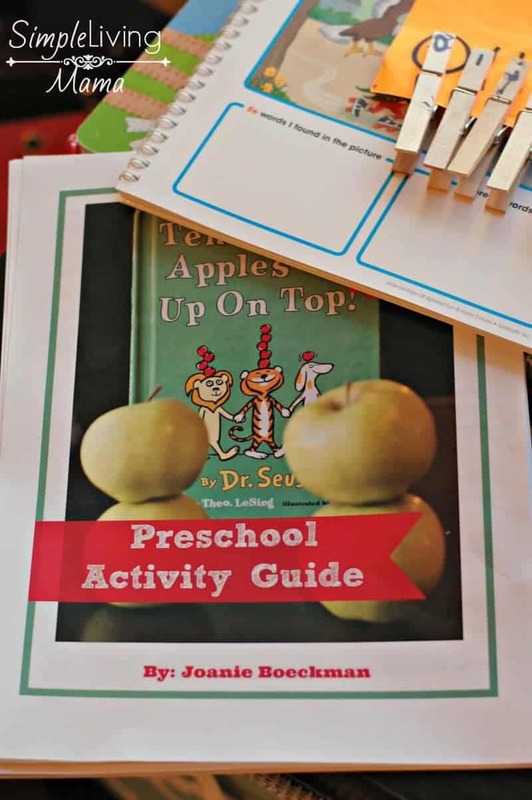 My preschool activity guide also includes worksheets to help preschoolers with pre-writing and writing practice. 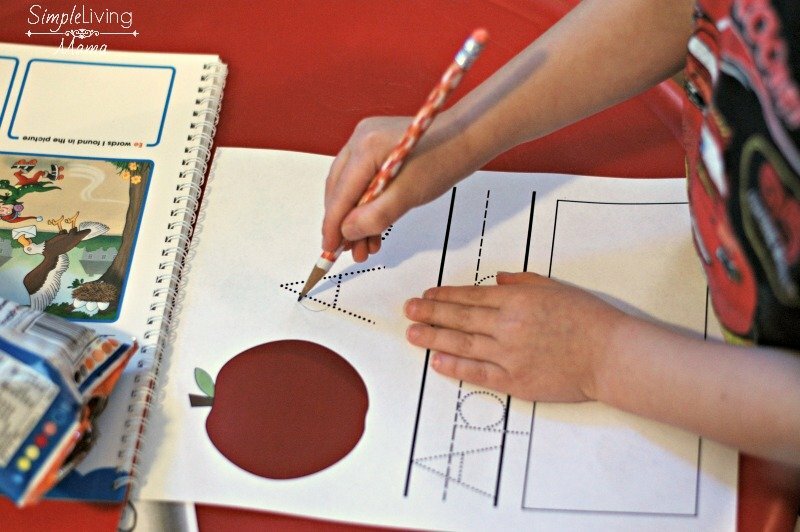 We work on pencil grip and correctly forming letters. Here is an extremely simple busy bag activity. I just used a large index card and wrote my preschooler’s name on it. 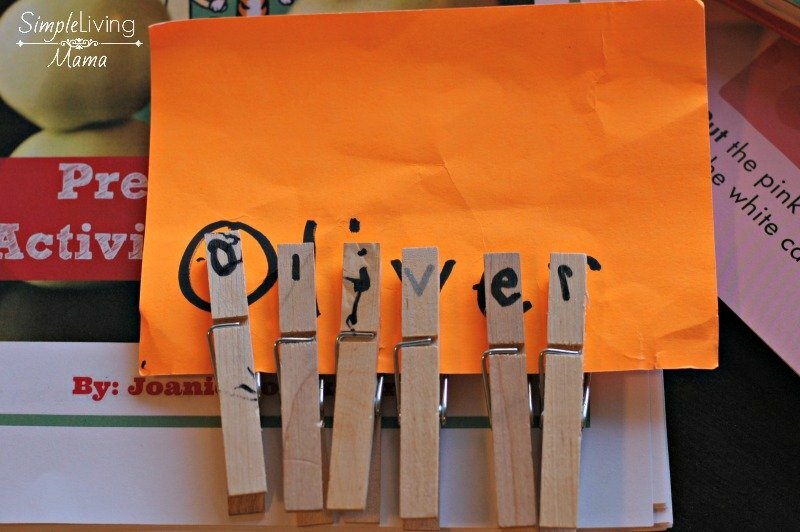 Then I wrote one letter per clothespin. He clips the clothespins in the correct place. This is how he can begin to recognize his own name in print. We will eventually work on writing his name when his pencil grasp is up to par. 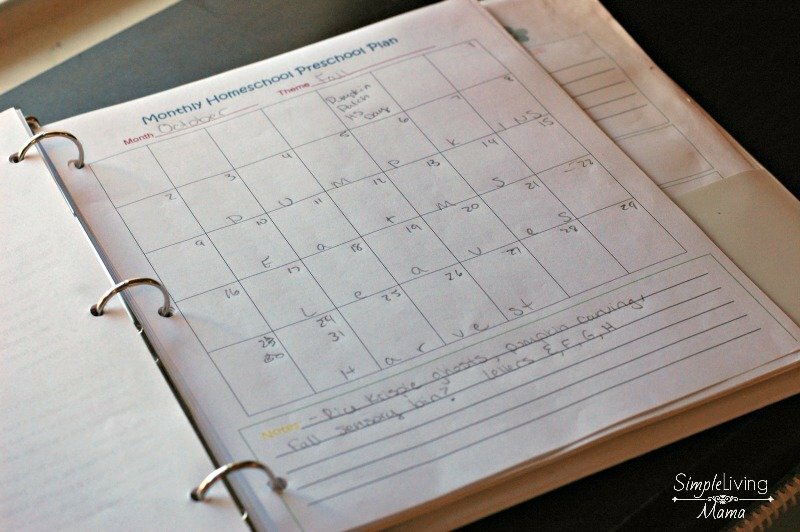 Here’s a look at my monthly homeschool preschool plan. For October, we are focusing on an overall fall theme. We will do one week with pumpkins, one week with farms, one week with leaves, and one week with a harvest theme. I write down any field trips we are planning, our activities, and the letters I am planning to focus on. Here is one of our pre-writing activities in action. 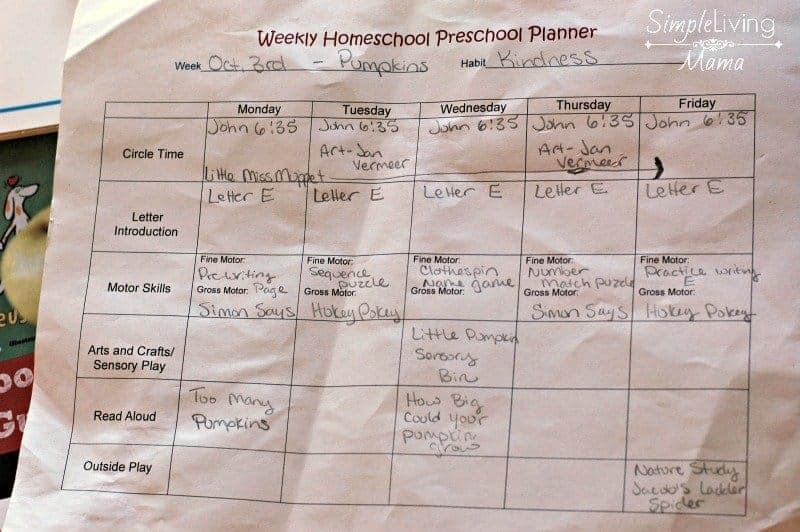 Here is my weekly homeschool preschool plan for the first week in October. We are focusing on pumpkins because we have a field trip planned to the pumpkin patch. I introduce one letter per week using an alphabet interactive notebook. That is different than letter writing practice I do during fine motor time. I also try to plan some gross motor activities. These activities do not always need to be planned. Letting children play outside or at a local playground is great for gross motor skills. I started working on our read-alouds. I do recommend reading aloud to your child every day. It’s a good idea to choose some books that match your weekly theme. 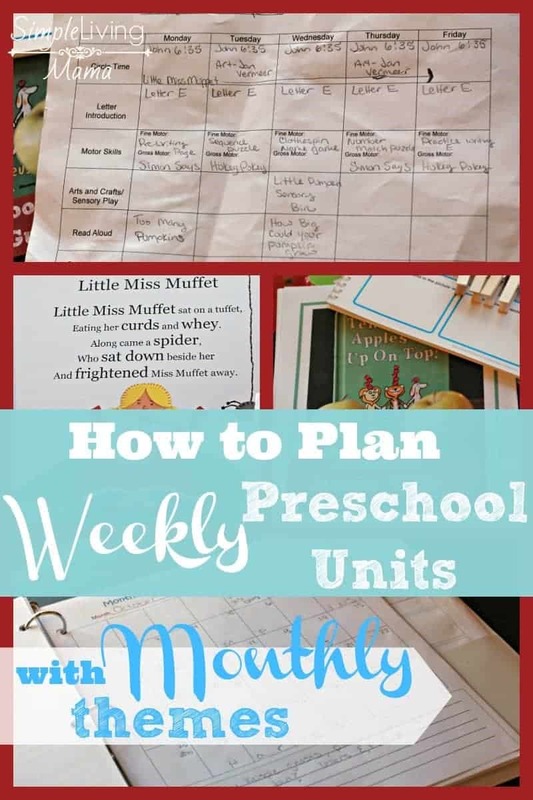 And that’s a quick look at how I turn those monthly themes into weekly preschool units. I keep the early years simple and fun!